ZSFG employees have many sustainable options for getting to work that can save time, money and eliminate the stress of sitting in traffic. $77.50 parking permit & designated parking spaces in the 23rd St. Garage. Apply at the LAZ office, located in the garage at the corner of 24th and Utah Streets. When is the next shuttle to 24th St. BART? Sharing the ride with just one other person can cut your commuting costs in half and with vanpools save with pre-tax benefits. Whether you chose to carpool or vanpool five days a week with the same people or occasionally share your ride as a driver or as a passenger, SF Environment Rideshare, 511, and Casual Carpool can match you with others who want to share a ride. UCSF employees can match using MyCommute. New apps offer flexibility for one-way, round-trip and sporadic carpooling. Learn about Scoop and Waze Carpool. Lyft Line rides are now eligible for UCSF staff for payment with your pre-tax commuter benefits. 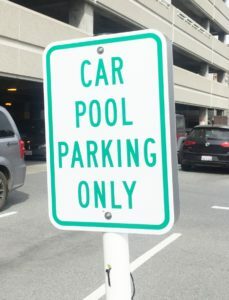 ZSFG is now offering a Carpool Parking Program which allows ZSFG staff to enjoy a preferred parking space in the 22rd St. Parking Garage and a discounted monthly parking permit fee. For more information, go here. Bicycling is a low-cost, healthy, and sustainable commute choice. High security bike cages, lockers, and showers are available on campus. To register to access the bike cages or to reserve a bike locker, email transportation@sfdph.org. Buses and shuttles to the campus are outfitted with bike racks. On-demand bike locker parking is available at ZSFG, learn more at BikeLink. Bike parking for larger bikes, family and cargo bikes, is available at Building 20. Oversized bikes are always accommodated in the bike cages. 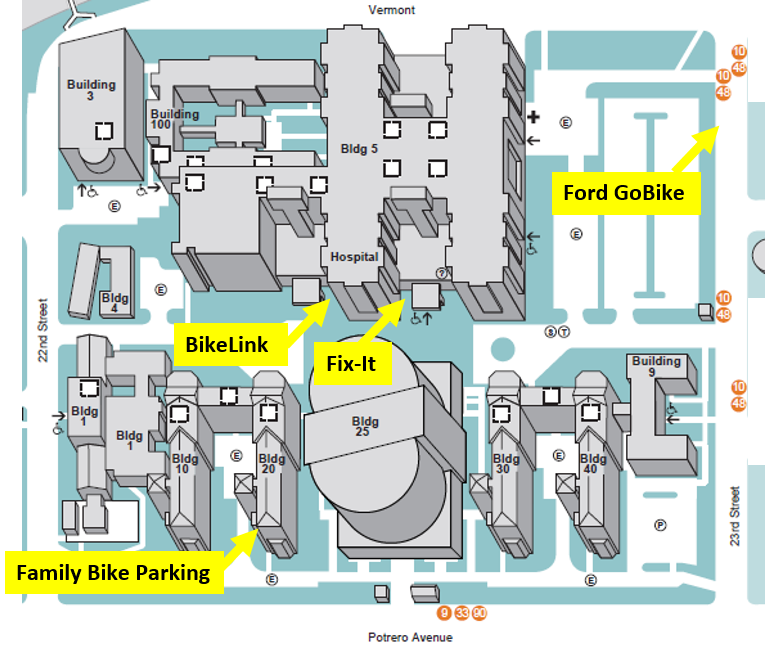 Located next to the bike racks outside of Building 5 south entrance, the fix-it station offers repair tools and an air pump. Ford GoBike is available at ZSFG on 23rd Street at San Bruno Avenue. City and County of San Francisco employees get $25 off an annual membership with Ford GoBike! To sign up (SFDPH and SFDPW only) visit member.fordgobike.com/group/sfd, enter the password: 89bh5, and enter your City email address to enroll. UCSF Bikes! is a staff run biking forum, socialize with fellow bicyclists, and participate in the committee. Join the conversation on Chatter: Sign into MyAccess, under applications type “Chatter”, click on “Chatter” search for “UCSF Bikes!”, Join the group. Learn the rules of the road, look for the best bike route, and learn how to prevent theft with the SF Bicycle Coalition. Do you bike, walk, jog, break a sweat and need a shower at work? ZSFG has two showers on campus for employee use. Cut your transit costs by as much as 40% through a pre-tax payment for transit expenses like Muni, BART, Caltrain, SamTrans, Golden Gate Transit and the ferries. City and County of San Francisco employees use the WageWorks Commuter Card to store pre-tax money you elect to deduct every paycheck, UCSF employees use Commuter Check Direct. The cards can be used to purchase transit passes or link it to your Clipper Card. The cards are meant to pay for transit expenses only. If you park and then take transit, you can use the benefits to pay for parking at a BART or Caltrain station. The parking lot must be run by BART or Caltrain. You must first be enrolled in the pretax program to be eligible for enrollment in the Parking Plan. A free Clipper Card is available to City and County of San Francisco, a $3 savings. Request your card here. For your safety, the San Francisco Sheriff’s Department provides employee escorts to the following locations: 24th/Mission Street BART station, nearby bus stop, parking lot, and to your parked vehicle. 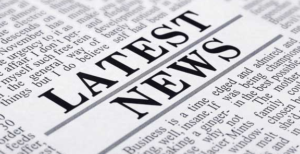 Call 206-8063, Monday – Friday, 3p.m.-11p.m. Find yourself sick at work? Carpool ride is unavailable? Need to pick up a sick child from school? Bike have a flat tire? Commuters working in San Francisco who walk, bike, take transit, carpool, or vanpool to work and experience a personal or family emergency while at work, can use Emergency Ride Home and be reimbursed for the cost of the ride. Emergency Ride Home is free to employees and requires a reimbursement form with receipts. UCSF has its own Emergency Ride Home program for reimbursement. Membership based hourly car rental is called car sharing; car sharing allows you to leave your personal car at home and still have access to a car when you need it. No car payments, no auto insurance payments, gas is included and a parking space is waiting for you when you return. Multiple car sharing options are available in the 23rd St. garage: Zipcar, Getaround, and Scoot cars and scooters. UCSF members can join Zipcar for $15 for the first year, join here and select “Students,” “Faculty and Staff,” or “Department” in the dropdown. City and County of San Francisco employees also receive a discounted Zipcar membership, email environment@sfgov.org, put “Car Share” in the subject, and request a discount. If you live close to ZSFG or to public transportation, consider walking to work. It costs nothing, creates no pollution, and requires no fuel. It’s an excellent way to exercise and connect with your community. The ZSFG community ranks high in a walking score, see the results. Do you walk or jog and need a shower at work? ZSFG has two showers on campus for employee use. Discounts are available for UCSF Students, Faculty, Staff and Retirees for the purchase of an electric vehicle. Special promotions change often, check the UCSF Sustainability discounts page for more information. The Zuckerberg San Francisco General Hospital and Trauma Center campus is served by multiple Muni routes: 9, 9R, 10, 19, 27, 33, 48, 90. Go to Muni for route and schedule information. For your convenience, NextBus predictions are broadcast via monitor in the main and outpatient lobbies. The closest BART stop to the Zuckerberg San Francisco General Hospital and Trauma Center is the 24th St. Mission station. Go to BART for more information, maps, and schedules. ZSFG offers a free shuttle connecting the 24th St. Mission station to ZSFG. UCSF offers free shuttle service to campuses throughout the city, including Zuckerberg San Francisco General. This service is free to patients, visitors and staff. Get Live Shuttle for up-to-the-second shuttle information. Go to UCSF for more information, maps, and schedule. ZSFG offers free shuttle service to the 24th St. Mission BART station during peak commute times. This service is free to patients, visitors and staff. Get more information, maps, and schedules here. When is the next shuttle? Go online or download the ZSFG shuttle app. To help alleviate parking around campus, SFDPH is leasing an off-campus parking lot one mile from the hospital campus at San Bruno Avenue and 16th Street. Monthly permits are available for staff to purchase, which allows parking during the hours of 6 a.m. to 8 p.m., Monday through Friday. These monthly permits cost 20% less than the 24-hour permits at the ZSFG garage. Free shuttle service between the lot and ZSFG is available during peak hours every 20 minutes, and a UCSF shuttle runs during afternoon non-peak hours (9:30 a.m. – 3:30 p.m.). Click here for more information or contact the lot operator Transmetro at: parking@transmetro.org or 510-830-5372. Go here to apply. The public parking garage, located at 2500 24th St. across the street from the hospital, is owned by SF Municipal Transportation Agency and operated by LAZ Parking. Until further notice, ZSFG will not issue new monthly garage parking permits. Staff who are parking in the garage hourly and/or on the street are encouraged to register for a permit to use the off-campus lot at 295 San Bruno Avenue. The 23rd Street Parking Garage also has bike racks, electric vehicle charging stations, and car sharing options (Zipcar, Get Around, and Scoot) available to everyone. Valet parking services are also offered. Call LAZ at 415-206-8770. The Transportation Program has been created to meet the transportation planning and management needs of staff, patients, and visitors. The Program is made up of policies, incentives, tools, and information to support employees in making sustainable transportation choices for their commute trips. Transportation Program Annual Summary, a report on program activities produced annually by the San Francisco Department of Public Health (SFDPH) which includes results and analysis of the annual employee travel survey.